The PS-2100 Databank stores 125 names and numbers in a credit card sized housing. The featured PS-2100 Databank was manufactured in June 1993 by Nam Tai Electronics, Inc. in China. Don't miss the inside-view of a disassembled and finally destroyed PS-2100. An orange edition of the PS-2100 was sold in Europe while the PS-9250 combines the PS-2100 Databank with the Day Runner® memo size refills in a small book. 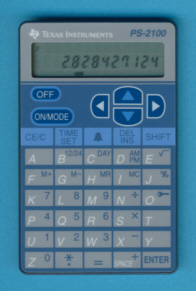 The PS-2100 traces back to the TI-2100 Pocket Info introduced in 1987. The PS-2100 is featured in the Texas Instruments Incorporated sales catalog CL-1233 dated 1994.